History does not begin in 1790. If you drew a graph from 3500 BC to now, you would see a huge anomaly beginning in th 17th or 18th century after 5000 years of relatively steady growth. The issue is that we actually live in a materially finite world - there is only so much matter and energy available to us on the surface of this planet. Anyone who thinks we can continue this sort of exponential growth for ever on now either thinks we will start consuming the rest of the solar system and then the galaxy sooner than expected, or is insane. Yes, Keynes is one of the most insightful commentators on the contemporary economic situation. True, there's an implicit argument by extrapolation there... 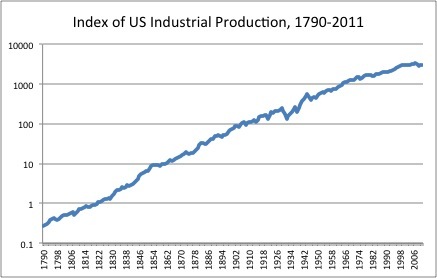 I'm not expecting technological progress and capital accumulation to stop anytime soon, but I could be wrong.